Uncle Chris is a "High-Energy" Entertainer who really gets his audience involved in everything that he does. He generates laughter and excitement everywhere he performs. And we're not just talking about the children... Adults love him too! He's great on stage for larger shows, or just as good strolling around in the crowds. His comical magic will make everyone laugh as he messes up his tricks and the audience member does the Magic! --- Uncle Chris the Clown does it all! 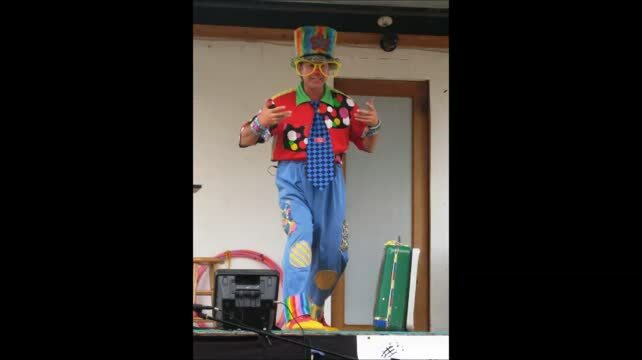 Uncle Chris the Clown specialises in Fairs, Corporate and social events and will plan just the right type of entertainment for your celebration. But don't forget that he still absolutely loves to do Birthday Parties! No matter how busy he gets with larger events, nothing beats the personal care he will give your group of children and give the Birthday child the one on one attention that they deserve on their special day. Watch the video below for 20 years of "Clowning Around"
I have been "Clowning Around" all throughout B.C. since 1999 and have literally done thousands of Events and Birthday Parties and constantly get asked to come back over and over again because everybody Loves Uncle Chris the Clown! People are always telling me that I must really love what I do because it shows...and they are right. From the moment that I put on my Big Yellow Glasses I become the character that everybody knows and loves and I don't stop entertaining until the job is over. I know that it's hard to believe everything that you read on line but I do want to let you know that I really am as good an entertainer as everyone says I am. All I ever get is praise and sincere "Thank You's" for doing what I do best... and that's making people smile! So have a look around my web-site. Check out the hundreds of pictures from different events I've been at and read just some of the hundreds of testimonials that past and present customers have written about me. Bottom line is if you are having any type of event that needs someone to entertain the people, young and old, then you really need to contact me and make arrangements to have UNCLE CHRIS THE CLOWN at your event! "Grown up" parties.. and they're a Blast!